Over the years, the compliance landscape has changed drastically from self-regulation to statutory enforcement, with the list of regulations constantly varying and growing to include anti-money laundering and anti-fraud legislation, privacy, finance, IT security and more. Today, the rising complexity of compliance is no longer a temporary challenge for organizations, but a new reality. Traditional desktop tools and legacy GRC platforms are replaced by state-of-the-art tools to keep up with changing requirements and process transformations to meet the business requisites. With the multiplying compliance standards such as PCI, HIPAA and more, organizations seek an integrated platform to track multiple regulatory changes and compliance metrics, tie them to business processes, conduct an impact assessment, and streamline policies and procedures. There is also a huge demand for innovative analytical solutions to monitor the compliance risks in real time and proactively spot the inconsistencies. It can also provide the flexibility for organization’s to not only mitigate the associated risks but also maintain compliance and increase productivity. To help CCOs, CIOs, and CEOs find the right compliance technology provider for their enterprises, our selection panel has evaluated and shortlisted hundreds of compliance technology solution providers that are at the forefront of providing cutting-edge technology solutions. During our evaluation, we looked at the vendor’s capability to fulfill the burning need of cost-effective and flexible solutions that tackle complex compliance challenges. 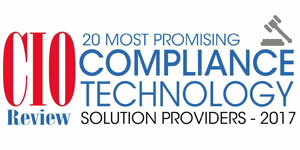 We present to you CIOReview’s “20 Most Promising Compliance Technology Solution Providers - 2017”.